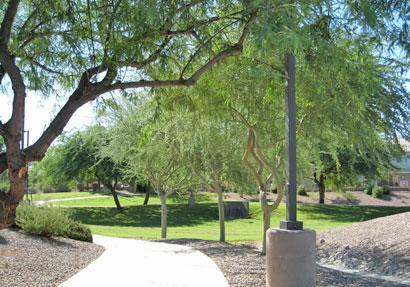 Enjoy the gorgeous views of stretching green belt & mature trees wrapping around 2 sides of this private serene backyard. That`s right, no neighbors on 2 sides! Lightly lived in & immaculately maintained this home is MOVE-IN-READY with brand new carpet, fresh paint, neutral tile in all traffic areas. Fantastic floor plan with many upgrades! Large family rm w/ surround sound for easy entertaining. French doors lead to 5th bdrm which can function as a den/bdrm. Master has private exit to backyard.